Thank you for your interest in Tendon Hammers. Please complete and submit the form below and an ADInstruments representative will aim to get in touch within one working day. If you’d like to speak to someone immediately, office contact information is available from the contact page. May be connected to a BNC input channel of any PowerLab recording system, to provide triggering, timer or marker signals. May be connected to a 8-pin Din (Pod) input channel of any PowerLab recording system, to provide triggering, timer or marker signals. 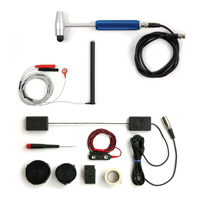 Tendon Hammers available for connection via the BNC input channel or 8-pin Din (Pod) input channel of any PowerLab recording system, to provide triggering, timer or marker signals. A piezo-electric sensor within the head, provides a momentary pulse when a surface is struck with the hammer. The hammer can be used to stimulate muscle spindles which elicit muscle contractions. Ideal for use with the Goniometer (Joint Angle Sensor) for tendon jerk studies.